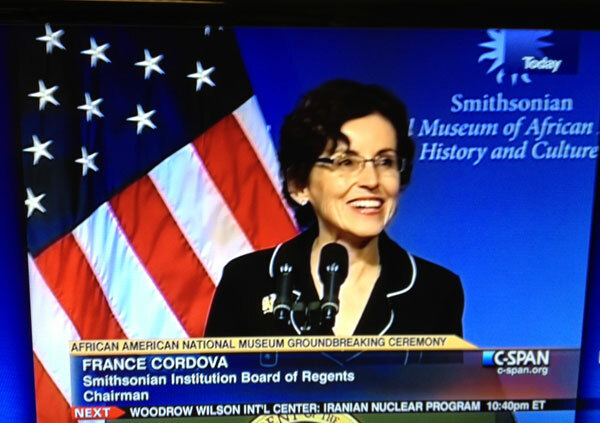 Purdue President France A. Córdova, chair of the Smithsonian Institution Board of Regents, took part Wednesday, Feb. 22, in the groundbreaking for the Smithsonian's National Museum of African American History and Culture. For more about the museum, go to https://nmaahc.si.edu/. More about the groundbreaking, including photographs, is available at https://newsdesk.si.edu/releases/smithsonian-breaks-ground-national-museum-african-american-history-and-culture.